You’d be forgiven for thinking there aren’t many things to consider when buying a tap for your kitchen. However, the best kitchen taps in 2018 are design-rich and filled with technology. Here we explain what features you can expect to see and rank the best kitchen taps of 2018. How to Install a Kitchen Taps 2018? Where to buy a new Kitchen Tap? 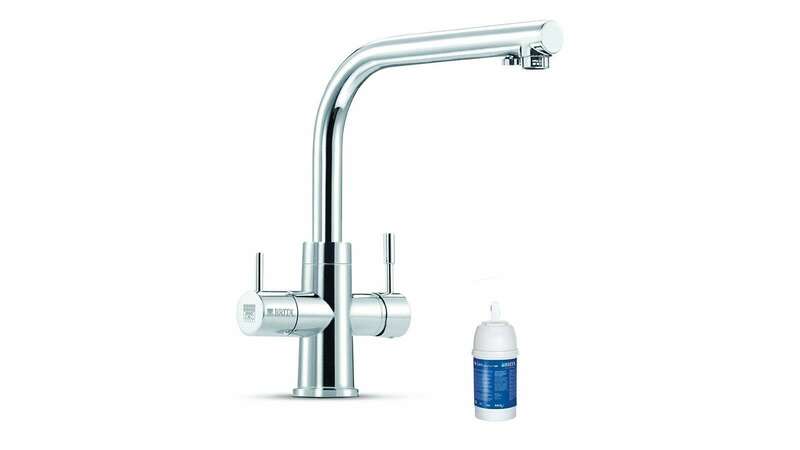 Where’s the best place buy kitchen taps? If you’re looking for a bargain, we recommend searching online retailers such as eBay and Amazon for the best value and widest range. However, you will have to wait at least a day for delivery if you buy from either of these sites. Alternatively, if you want to get your tap on the same day, try the click-and-collect services offered by retailers such as B&Q, John Lewis, Wickes or Ryman. These are likely to be more expensive than online-only shops. The GROHE K7 is our pick of the best kitchen taps 2018. It looks great, with its scratch-resistant chrome finish. That’s not all though. It’s also practical too. And powerful. The 140-degree fixed swivel lets you aim a powerful jet of water down into any section of the sink, while the detachable 360-degree spray feature lets you direct a powerful jet (or fine spray) in any direction you need. Its StarLight chrome coating is also popular with customers as it prevents the buildup of limescale, even in hard-water areas. It’s expensive, yes, but you’re buying quality manufacturing and materials. The end result is a stylish and practical kitchen tap that’s built to lasts. People who’ve bought the BRITA Waterbar swear by it. It’s essentially a tap that’s split into two parts. On the one side is your normal hot and cold water control, on the other is BRITA-filtered drinking water that’s ready instantly. The filter is up to BRITA’s normal standards, protecting you from limescale and chlorine that’s usually found in tap water. This tap comes bundled with one cartridge and each filter is designed to last for 1200L or four months. Replacing the filters is easy and is a job anyone can do. Installing the tap is relatively straightforward for anyone who’s good at DIY, failing that it’s a simple job for any qualified plumber. This is more than just a tap. It’s your new kettle too. With the Hyco Zen Solo, you have on-demand access of up to 3 litres of 100°C instant boiling water. It’s not expensive either, on average it will cost a household 4p per day (based on electricity cost 10p/kWh). The tap comes with a built-in ready and green LED lights that indicate when boiling water is ready or heating. There’s also a pull-out and turn safety lock mechanism, to prevent scalding hot water coming out of the tap accidentally. The Avola Semi-Professional Spray Head Pull-Down Kitchen Sink Mixer Tap may not be the best-named tap. 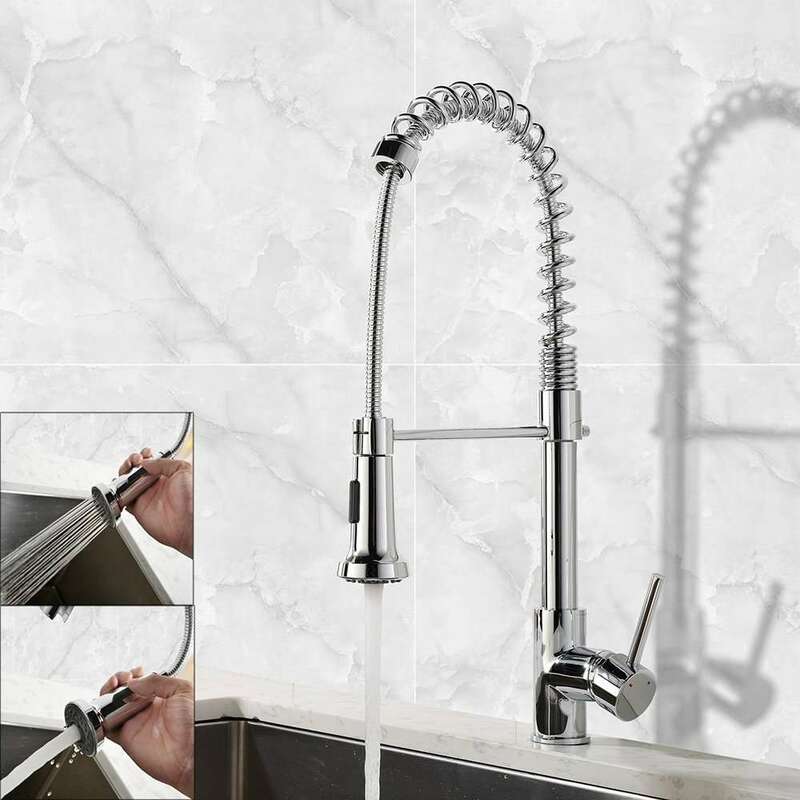 But if you’re on a budget and you want the professional-grade performance of a pull-down swivel mixer tap (without the price tag) then this tap from Avola is a great choice. The Insinkerator 3-N-1 is a great option for any home. As its name suggests, it does three things. Its flagship feature is 2.5 litres (100 cups) of instant boiling water. Second, it filters limescale and chlorine from cold tap water. Third, it’s a normal, everyday, hot and cold kitchen tap. The instant boiling water feature is fully adjustable thanks to a digital scale on the water tank. It has a self-closing safety feature too, which prevents users from accidentally scalding themselves. Like all instant hot water taps, the Insinkerator will only just users a few pence in electricity to run per day. This is thanks to its high-end insulated water tank that keeps water hot throughout the day. Give your kitchen a more traditional feel with this gorgeous dual-crosshead tap. It’s high-quality brushed-chrome finish makes it fingerprint and water-spot resistant – helping you keep a clean-looking kitchen with minimum effort. This tap is fast and easy to install and comes with a 5-year limited guarantee. Smooth stream/spray water flow, drip-free. If you’re not looking for a tap that comes with a built-in filter or instant boiling water, this is a great option. It’s 360-degree rotation and high-arch pull-out sprayer make it versatile and convenient for washing up. The Hansgrohe Focus 240 has two jet types and a high-arch that frees up 50cm of extra sink space. 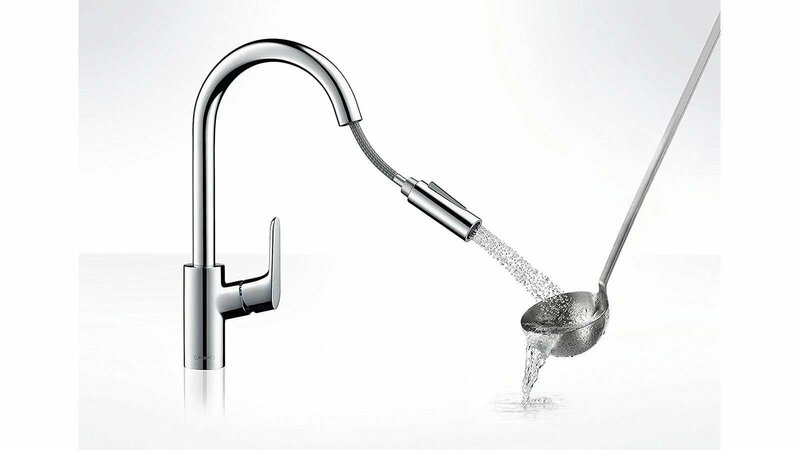 The tap is a single lever mixer with a hand spray designed to let you reach a greater range of angles around the sink. Enjoy the extra convenience! The hand spray can be pulled out up to 50 cm and offers two jet types, allowing you to toggle between them according to your needs. Ceramic head Ø 35 mm. Control: lever on the side of the mixer. Dimension of the mounting hole: Ø 35 mm. The total height of tap: 290 mm. The height to the end of the spout: 209 mm. 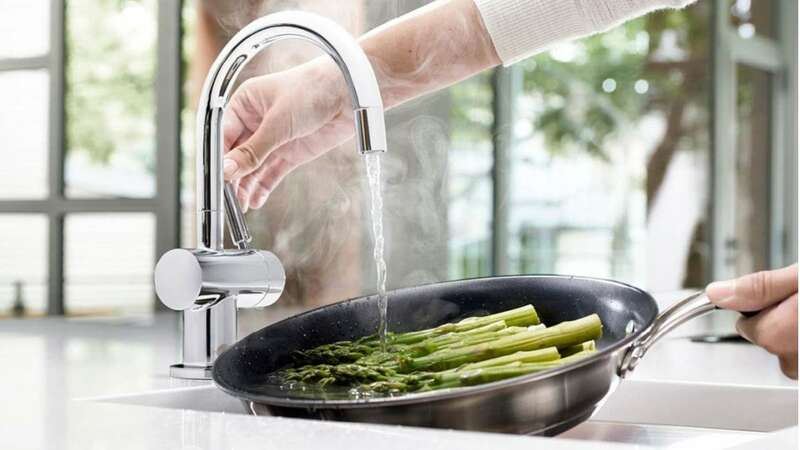 If you want a high-quality kitchen tap, but still desire n old-fashioned design, the Franke 115.0028.205 kitchen tap could be just what you’re looking for. It offers total control with a 360° rotatable spout and single-lever operation. If you’re not looking to spend too much on your kitchen tap, but still want a unit that does the basics and looks great, this united from Taps UK is a great option. It’s easy to install and comes with a durable chrome finish that will look great in any kitchen. It’s got a high-arch that frees up plenty of sink space and is 360-rotatable. This tap has all the fashionable modern features – 360-degree rotating spout, gooseneck design, memory hold, without the massive price tag. It’s made from high-quality copper with a chrome finish and the 360-degree rotating spout has a memory hold. If you’re looking for a good-looking, functional and well-priced kitchen tap, this is it. You don’t need a lot of tools to replace a kitchen tap. If you have the following, you’ll be able to install the vast majority of kitchen taps yourself. Just watch the video below for a demonstration. If you have the time to spare, and a reasonable toolkit, there’s nothing stopping you from installing your new kitchen tap. Watch the video below to see the steps involved in removing your old tap, and installing your new one. Amazon is now going one step further. You can now buy services from Amazon. This means you can buy your new kitchen tap and hire a plumber to install it for you too. All through Amazon. There isn’t a fixed rate for this service as it will depend on what plumbers charge in your area. However, we recently tested the service out with a South West London postcode and got quoted £85. 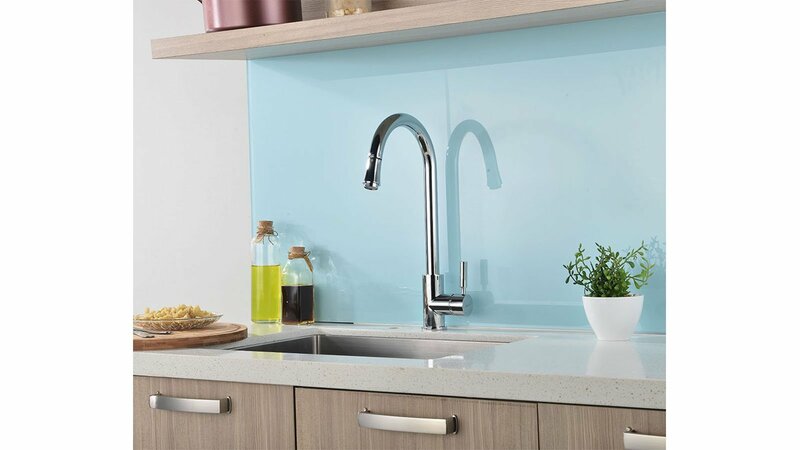 Click here to get a Kitchen Tap Replacement quote from Amazon. Below you’ll find several features to consider before making your purchase. Remember, there’s no right or wrong choice for any of these. You should make your decision based on personal preference and budget. Fixed or flexible/360-degree spout: Flexible spouts used to be a feature reserved for restaurants or industrial kitchens. The main benefit of a flexible tap is versatility when washing up or filling oversized containers, making it a desirable feature. The downside is that they are modern looking so don’t fit in with every kitchen’s design. The solution here is to look for a pulldown flexible tap that’s hidden inside a fixed spout. Faucet/Nozzle: If versatility is what you’re looking for then we suggest paying close attention to your tap’s faucet. Most taps come with a basic design that simply channels the water into your sink. More developed faucets let you manipulate the stream. See also: The 6 BEST Halogen Ovens 2018. Aerator (aka flow constrictor): These are the taps your find in nice hotels and restaurants. They mix air and water to provide two main user benefits. First, it saves the amount of water you use. Second, it reduces the splash when the water hits the sink. Filter taps: This is the same principle as filter water jugs. The only difference is that these taps actively filter as they draw water from the pipe, giving you an unlimited supply of chlorine-, bacteria- and lead-filtered drinking water. Taps with built-in filters also reduce the build-up of limescale in your appliances. The downside is that you have to replace the filter every six months to keep it effective. 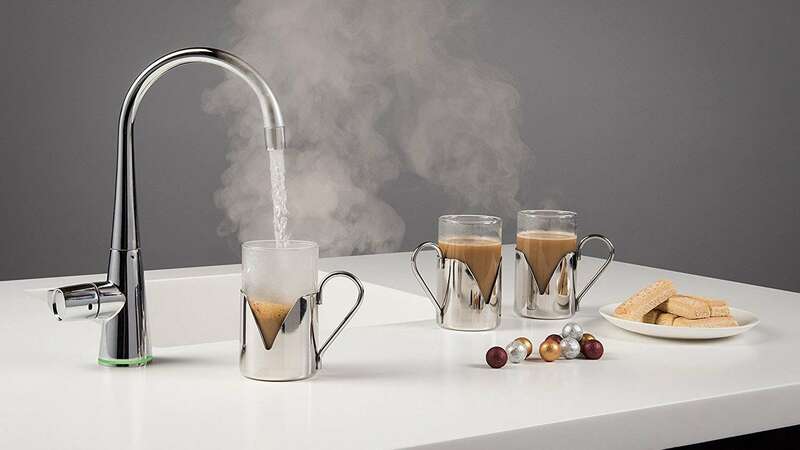 Instant boiling water: High-end kitchens sometimes come with instant hot water functionality. This is a great feature if you live in a busy household where people come and go regularly. If this is an option you want, make sure your tap has a childproof safety feature and a temperature warning indicator. It’s also worth considering the size of the tap’s tank if you’re looking to dispense large amounts of boiling water. Buying a mixer tap with that dispenses instant boiling water can be expensive. If you’re looking to save money it might be advisable to buy a dedicated instant boiling water tap to sit next to your traditional mixer. LED Temperature Lights: Say goodbye to scalding your fingers as you test your tap’s water temperature. Faucets fitted with LEDs that react to water temperature let you visually see how hot/cold the water is via blue, green and red lights. Note that this shouldn’t be a deal breaker when buying your tap as LED faucets are more commonly retrofitted. Read next: Best Sandwich Maker 2018.